Barely a few years old and already so stylish! Happy 2nd birthday, Olivia Manzano Reyes! To celebrate her turning a year older on March 20, here are some of our favorite outfits she's ever worn. Who needs shoes when you're wearing a pretty pink dress? She'll be a pro at walking in high heels in no time! A day at Disneyland calls for a fluffy tutu and comfy sneakers. Don't forget the Minnie Mouse ears! 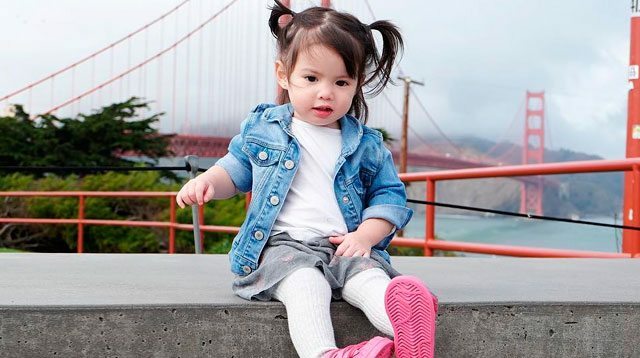 We totally want adult versions of her denim jacket and pink sneakers. Trick or treat! Who could resist Olivia as BB-8, though? Or Princess Leia, for that matter? How adorable is her tiny blush swimsuit?